We've seen scads of hyperrealistic paintings that trick our minds—but what about brain-befuddling sculptures? 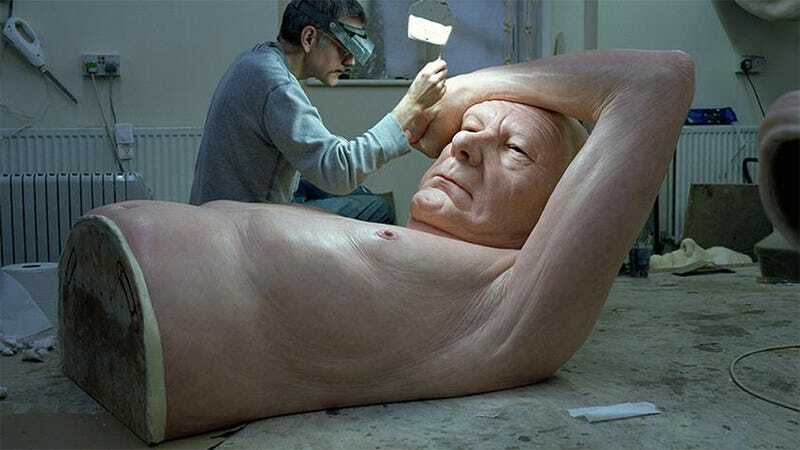 Meet Australian hyperrealist sculptor, Ronald "Ron" Mueck, who uses silicone and mixed media to create shockingly lifelike figures. The colors and proportions are nearly perfect on every piece—but what makes them so uncanny is their massive scale. For example, Mueck's sculptures include a newborn child that takes up an entire room, and an old man the size of a cavernous gallery. Though Mueck has been on the scene for almost two decades, he's still creating new work. The artist's three brand-new creations, produced especially for the Fondation Cartier, are on exhibition in Paris until September 29, 2013. It's not to be missed, if you happen to be in France. In the meantime, check out a handful of past work Mueck's work below. Woman With Shopping Bags, 2013. Couple Under an Umbrella, 2013.